We are definitely back in business now. All teams competing in the next edition of the EHF Champions League are back in training. The last to join were powerhouses Paris Saint-Germain and Barca Lassa, whose players enjoyed some more holidays compared to their European opponents. After moving from one club to the other this summer, Viran Morros took pleasure in meeting Spanish compatriot, Rodrigo Corrales, as well as former Barcelona and current PSG teammate Nikola Karabatic. In Catalunya, on the other hand, it was not all about running. After recently extending his contract, French national player Dika Mem went back to training, and as this picture proves, it was all about handball in Palau Blaugrana. All players, old and new, apparently really appreciated the basketball break in the middle of the physical preparation. And if basketball was the sport of choice in Spain this week, in Germany, they chose some kind of mix between beach handball and water polo. It is played in a pool, featuring several known handball moves and it looks very, very spectacular. And as if this swimming pool session wasn’t enough, the Rhein-Neckar Löwen boys also had a try at biathlon. There you can see Mikael Appelgren and Bogdan Radivojevic looking very, very, focused. After karting a few weeks ago, this is another page of a preparation which is truly unique to the Mannheim men this summer. Nantes took another turn in their preparation this week. 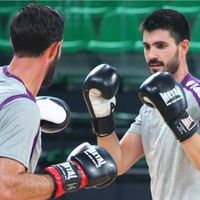 Before playing, and winning, their first pre-season match in Portugal this weekend, ‘Le H’ tried their hands at several activities, including football and boxing. Not to worry, nobody was sporting a black eye by the end of it, as far as we know. Carrying on with the French clubs, the girls at Brest Bretagne Handball only had to walk a couple of meters to go to the beach and surf. They dived right into the ocean to “work on their side steps” and the afternoon was a moment of pure fun for everybody, especially with the weather was on their side. Back to the more traditional preparation as Skjern and Flensburg played against each other in a friendly game on Friday. And as some of you may know, a lot of the Danish players have also worn the SG jersey in the past, thanks to the Flensburg situation, next to the Danish border. For Anders Eggert, it was not his first time facing his old team, but it was for Thomas Mogensen and Jacob Heinl. The emotional moment was made even more special by the Danish centre back induction to the Flensburg Hall of Fame. Sticking to Denmark, another former national player was on the run this week. Bjerringbro-Silkeborg line player Jesper Noddesbo was attending some clothes stand and bumped into his mate Mikkel Hansen. As handsome as usual, but apparently a bit quieter than usual. And to wind up this crazy week in Champions League world, preparation is a also a time during which the teams share time with their fans. In Hungary, Györ opened their training to the public and hundreds turned up to witness the event. In Spain, interaction between fans and players took another shape, as Ademar Leon’s Sebastian Simonet and his teammates took time to sign every goodie which was thrown their way at the end of a training.